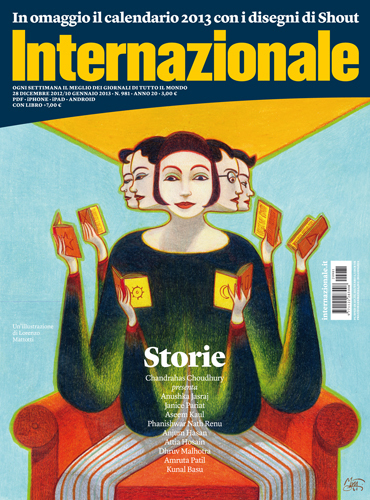 Here is an essay I wrote recently for a special Indian fiction issue of the Italian magazine Internazionale, produced in collaboration with The Caravan, in the last week of December 2012. I wrote it in my capacity as the Fiction & Poetry editor of The Caravan, and I attempt to introduce some currents in Indian fiction today and explain why The Caravan publishes fiction every month when it's primarily a magazine of narrative non-fiction. I've also made short notes on the stories in the issue (some of which were earlier published in English in The Caravan) -- literary-critical notes for the most part, and autobiographical in the case of my own story "Captain To The Poles". I chose in the main to leave out stories in Indian languages other than English because of the practical and methodological difficulties inherent in translating an English translation into another language. The Caravan of India is a monthly English magazine of politics and the arts that specializes in long-form narrative journalism – in the work of fruitfully complicating facts and opinions that circulate in the public sphere, and generating detailed profiles of the men and women who exercise power in India, not always wisely. Every issue of the magazine contains six to eight pieces of reportage from five to fifteen thousand words long. But of course, it is not just journalism that probes the secret vortexes of the world. So does fiction, by techniques and juxtapositions native to its realm, through the attention and craftsmanship of a bright individual sensibility that seeks to prove nothing, but generates sparks of meaning at every turn. Every month, the magazine publishes a short story by an Indian writer, young or old, classic or unknown, in English or in translation from one of India’s twenty or so other major languages, from Hindi in the north to Tamil in the south and Bengali in the east to Gujarati in the west. The magazine’s literary pages seek a representation in fiction of the diversity of meaning-making systems and high and low religious and political traditions that so fascinate different kinds of people: both the first-time visitor to India, and also the Indian who has never even left his or her country. But they desire, too, the steps beyond such highly aware mimesis. In literature, The Caravan admires that fastidiously shaped language, that trick of narrative technique, the use of ellipsis and of contrast, that gives fiction its complexity, durability, and finally – in a journalistic age – its autonomy. The stories I have put together in this small anthology of Indian fiction for Internazionale include some published recently in the pages of The Caravan, as well as the work of other contemporaries of mine whom believe to be the among the best and brightest voices in Indian literature today. I have tried to put together the most diverse collection of styles I could find so as to make the point that the Indian writer of fiction is first and foremost – and freest as – an Indian writer of fiction. That is, if he takes his subject from what lies in front of him, he generates his style from a set of influences that know no borders. Calvino may be more important to him or her than Salman Rushdie; the realism of Giovanni Verga more useful in decoding the minds of village folk than the work of the great Indian realists. Two of the stories included take full advantage of one of fiction’s greatest freedoms: the capacity to rove widely across time and space, and to bring to narrative life the silences that lie at the interstices of history. Kunal Basu’s “The Accountant” begins with that most prosaic of figures, an accountant trapped in a life of drudgery, and somehow makes him an actor the grand romance of the Taj Mahal – and not the Taj as we know it today, but a yet-to-be-built Taj confined to map and mind, the subject of palace intrigues, a site on a river-bank and nothing more. Anushka Jasraj’s “Radio Story” takes the reader into the world of the Indian independence movement, and a small plot by a Bombay clique – whether more passionate about nationalism or radio-wave technology, we cannot tell – to start a secret and dissident radio station. There are stories here about family, set in both urban and country landscapes. Janice Pariat’s “Boats on Land” poetically describes a teenager’s sexual awakening on a family vacation on a tea estate, and powerfully evokes the seductive power and danger of the human body. Anjum Hasan’s artful montage “Saturday Night”, about the parallel dilemmas (one about a baby that is absent, the other about a baby that is somehow too present) of a middle-class married couple and a maid in the southern metropolis of Bangalore. Phaniswarnath Renu’s comic story “Panchlight” (the only story here to be doubly translated, from Hindi to English and then from English to Italian) opens out for the reader the hierarchical social world of castes in an Indian village. It is also a parable of twentieth century India’s encounter, full of creative misunderstandings and adaptations, with technology. In Renu’s story the warring castes (and lovers) are eventually reconciled, but in the late Attia Hosain’s “Storm” we encounter the dissident, rootless individual who appears from nowhere and provokes the entire social order, so uncompromising it seems she is alive only if she opposes. Of course it is fiction’s work to show us why, precisely when life it at its most settled, some individuals must bring about a storm. I chose Aseem Kaul’s “Where Shall We Have Dinner Tonight?” for its exquisite minimalism and its interrogation of dozens of short-story conventions (fiction must question conventional thinking not just in human affairs, but also in fiction). We are given no names or background for the characters, and there is no narrator’s voice in the story: all we hear are two voices, and with each move they grow in force. And as for my own story, “Captain To The Poles”, it is drawn from incidents from some of the happiest years of my youth. These were days spent in a restaurant near my small, decrepit flat in Mumbai, watching the world pass by (and through) the restaurant, which was like a stationary caravan. The months passed in listening to the patter of voices (the tall tales of the customers, the barbed observations of the waiters) and serving as friend to the proprietor, confidant to the staff, and taster of the menu. The restaurant was not just my School of Life, it was – because it was intensely interested in stories, even if totally uninvolved with books – also my School of Literature.